How To Make A Delta Kite - Step By Step: MBK 1-Skewer Delta. These instructions on how to make a Delta kite are fairly detailed. However, the reward is a great little light wind flier! Just the thing for a gentle evening breeze. About the only tool required by these instructions is a pair of sharp scissors. Any other materials you don't have are easily bought from local shops. If not exactly what I used, then at least something pretty similar! The pictures should make things pretty clear. Just quickly work your way through from top to bottom, skimming over any detail that you don't need. The MBK 1-Skewer Delta kite is quite small at 1.0SL (29cm, 11 1/2") in length, but copies the full-size Deltas with a floating spreader and triangular keel. 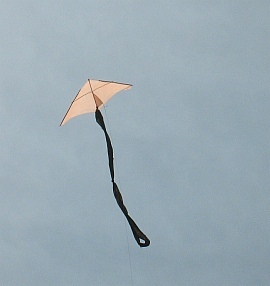 The little skewer kite flies best with several skewer-lengths of tail. A tiny bit of extra plastic taped to one wing-tip can correct a turning tendency, but this might not be necessary. Now's the time to read up on kite materials and other things needed for building a Delta kite, if you haven't already. 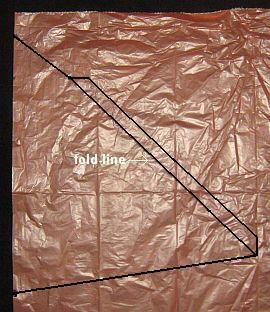 Firstly, take a bag that you want to use for the sail, and lay it flat on the floor. Mark dots on the plastic which correspond to the corners of the Template. Any small errors in position don't matter since the sail will be symmetrical. Using the marking pen, rule lines between the dots. 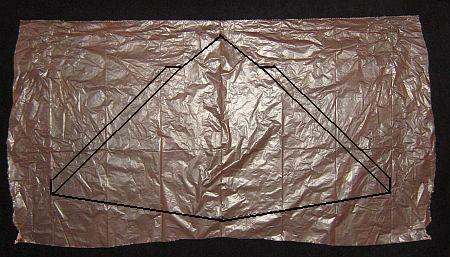 Lay down clear sticky tape along all edges of the sail except the long edges of the 2 tabs. The yellow marks represent the tape in the photo. 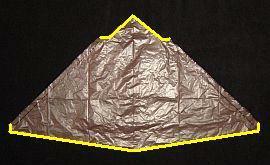 To save weight, try to put only ¼ of the tape's width inside the sail outline. Cut along all the black lines, with scissors.